If you’re an established entrepreneur, you’ve probably heard people talking about “brand voice,” specifically when addressing how to have an effective brand strategy. But if all that talk just leaves you scratching your head, you’re not alone. To simplify, think about it this way: Just like your biz has colors and images, it has a voice. What the heck is brand strategy and why does it matter? Let’s answer this question with an illustration. Have you ever been on a road trip and driven through some tiny little town right around lunchtime? Your stomach is grumbling and you’re looking for a good place to eat but (dang it!) it’s Sunday and everything’s closed. Oh, wait… There’s a place that’s open just up ahead… it’s Mexican! No, wait, it’s…Italian! Wait…what? Taco Piazza? It’s BOTH?! So you pass on by and decide to settle for a bag of chips and a Coke from the nearest gas station. I think we’d all agree that the thought of a burrito smothered in spaghetti sauce doesn’t sound super appetizing. Maybe that’s not really a menu item, maybe the chef is really gifted at homemade tortillas and homemade ravioli, but regardless, we’re not buying it. Literally. We are NOT buying it! Because as much as the chef may want us to believe that he can seriously cook up some mean enchiladas and plunk them down next to a sizzling dish of chicken cacciatore, potential customers are most likely going to keep on driving. You know how if you’re shopping at Target and you hear your sister’s voice from two aisles over, you just know it’s her? This is similar to how your audience experiences your brand voice. It’s the consistent message and identity that you present to the world. You have a core message, and you need to be consistently communicating it. You use the same words, the same phrases, the same mantras. You want to be so consistent that when your target audience hears a certain expression, they automatically know that it’s you. So what is your brand strategy? Two sentences: Consistently be. Be consistent. Basically, try to avoid offering burritos with a side of garlic bread. Because your audience will disconnect. You’ll lose them. They just won’t believe you anymore. Am I running a Taco Piazza? Are you confusing your potential clients because your brand is all over the place, rather than you being 100% solid on what you do? Is your message scattered and unclear? Is it too broad? Too general? Too generic? Is your brand having an identity crisis? If you’re answering “yes,” and you’re in a hurry, make sure you download our free Brand Voice Guide before you run off. It’ll help you find and refine your voice and message. But if you’ve got a few more minutes, read on for some great tips! You don’t want to start offering burritos with a side of garlic bread. Because your audience will disconnect. You’ll lose them. They just won’t believe you anymore. So how do you figure out “your voice”? Keep in mind that your voice is important to your message, but not the same thing. Your message stands on its own. Your voice is how you communicate your message. Other people and entities could be broadcasting the same message, but your voice is uniquely yours. This is why establishing your brand voice and brand strategy are so important. They make you stand out. They make you… YOU. 1) Brainstorm what makes you unique. There may be a million people who do what you do — but no one is you. You are unique, and you bring your own special take to your industry. You have something important to say, and you just need to say it in the most authentic, connecting, and inspiring way. What do you disagree with within your industry? What opportunities are being missed in your industry? Your answer to either of these questions will tell you a lot about how you’re different. 2) Define your core message and pillar content. Messaging: How to refine and share your big idea (your North Star) in a clear, concise way that achieves your vision. Strategy: Specific methods to connect your message with your audience (such as email funnels, content repurposing, copywriting strategies, etc.). Leadership: How to use your messaging + strategy to elevate your big idea, step forward as a leader, and create positive change. The goal is that you, too, can be free to do what you love and get your unique and impacting message out to the world. 3) Come up with a word bank and phrases that are distinctly you. If you’re not sure, read back over the content you’ve written and published. Notice the things you say ad nauseum. For us, having a brand voice guide that includes a word/phrase bank has been helpful as we scale and add people to our team, because it ensures that they sound like “us” when they’re helping get our message out there. You can pass your word bank off to anyone. A freelance copywriter, a VA, a Facebook ads strategist, or anyone else who is involved in your brand strategy. Not sure how to capture the words and phrases that make up your brand? You can download our free Brand Voice Guide—it’s a great place to start nailing down a brand voice that sounds like you and attracts your target audience. Sometimes, it takes an outsider. The tricky thing about being the messenger is that sometimes, you think you’re communicating well, but you’re biased because you KNOW what you’re trying to say. The rest of the world doesn’t. We like to use the example of being inside a jar. You may WANT to read the label that tells you what’s inside the jar with you, but because you’re on the inside, you can’t see what it says. You need someone from the outside to let you in on the secret. If you aren’t communicating those big dreams and ideas of yours, we all miss out. It helps to have an outsider come alongside of you and communicate back to you what you’re saying. So now what? You’re a thought leader, a world-changer, and a go-getter, but as your business has grown, you’re worried that your message (and voice) is all over the place. You’re not convinced that you’re being consistent. You’ve got a sneaking suspicion that you’re operating a Taco Piazza joint, but you’re not sure. All you know is that you’ve got something to say and it hasn’t been landing quite right. As a resource for entrepreneurs and thought leaders, one of the roles we play is to intentionally place ourselves on the other side of your message. Basically, we tell you what’s on the label of that jar you’re stuck in. Your brand voice is inseparable from your messaging and strategy, so defining brand voice and brand strategy is something we do with each one of our copywriting clients. It’s a non-negotiable part of our process, because it helps us understand your voice and it helps you identify everything from pillar content to most-used words and phrases. We are able to do this because we are listening to your message and only hearing what you’re saying. 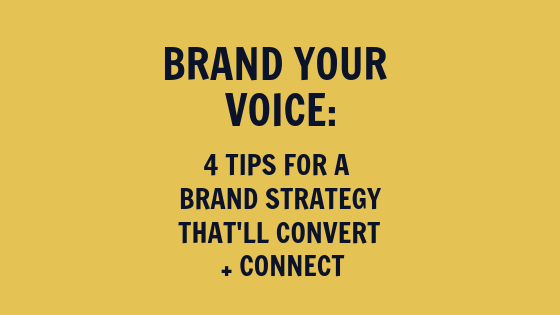 If you’ve downloaded our free Brand Voice Guide, but you’re still not confident that you’re broadcasting the true heart of your message in a way that allows your target audience to connect with you, you might benefit from our Branded Voice Guide package. This involves a survey and then a 30-min interview where we analyze your message, idea, and audience, and then do the tough work of defining what it is you say and do in a way that makes you stand out from the crowd as the leader you are. Within a week, your BVG is in the mail, and then we’ll top it off with a final 30-minute conversation about how to make sure you get the most out of the guide as you create a consistent voice across multiple platforms. This is where you bring in the pros (yep, that’s us) so you don’t have to stress about this “burritos and biscotti” stuff. Basically, here’s what we’re trying to say: you need a brand voice guide. Whether you download our free one and do it yourself (you totally can! ), or have us come in and do it for you, you will not regret the clarity, confidence, and tranquility it’s going to bring to your life. If you haven’t yet found your “North Star,” this is going to help you! We want to see you thrive in your business and step into that leader role you were born to fill. It’s made such a huge difference in our business, and we know that it will do the same for yours. We understand that outsourcing your message can be scary, but having a Brand Voice Guide gives you confidence that the messages you’re dishing out truly communicate your big idea to the world. Friends, say adios to the messaging mix-up – there’s no need to serve up confusion anymore. When you’re consistent with your message and your voice, your audience can trust you. And when your audience can trust you, they’ll be fans for life. Doesn’t that sound like a relief? We believe you’re totally capable of figuring this “voice” thing out. But if you’re feeling overwhelmed by all the complexities of messaging and marketing, then let us do the heavy-lifting for you. Click here to get in touch about a personal Branded Voice Guide Package.